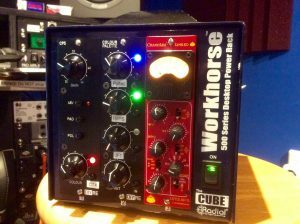 This article is about how we recorded vintage style vocals at my recording studio in Vermont; Dreamery Productions. 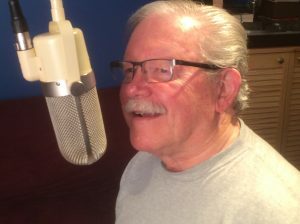 I recently had the pleasure of recording an old friend and former band mate, Bob Lauterbach. Bob is as an accomplished vocalist and percussionist that’s performed with groups in New England, Europe and now in Florida. Bob went to U.N.H and Plymouth University where he got his degrees in teaching and music and met his wife, Judy. After graduation, they joined the peace corps and worked in Borneo, Malaysia. Returning to New Hampshire Bob continued his career as a teacher and musician until retiring in Florida. In order to capture Bob’s vocals in a vintage style or vibe, I selected a large ribbon microphone, the RA-mkII, made by Golden Age. The signal went into a Cloudlifter CL-1 to provide a clean boost and then into a MPAII mic pre (with a Tung Sol 12ax7 reissue tube that I had swapped out). (FYI brand snobs: in a blind independent listening test done by Sound on Sound), the MPAII preamp, to everyone’s surprise, was consistently selected as one of the best sounding mic pre’s. I dialed in the controls to get the basic vocal sound I was looking for. Next, I ran the vocal signal through a some 500 series modules I built myself a CP5 mic preamp and a 500 series Colour Palette with some Colour module circuits (designed by Peterson Goodwyn, Brad McGowan (former rocket scientist) and some other creative designers). The Colour circuits included a CTX Cinemag transformer, a Pultec style frequency shaping circuit and finally a 15IPS circuit designed to emulate the warmth of quality tape recording technology. With some critical listening I dialed in subtle amounts of analog circuit “Colour” to get the more of that vintage sound. Then we tracked the vocals. With an excellent vocal performance in the box, I EQ’d, compressed, and used a few tricks along with my proprietary blend of spatial effects. I played the final mix. Bob smiled and said “you’re a genius”. What I enjoy about being a recording engineer and music producer is the shaping and crafting of sounds to get a feeling. The sound of Bob’s voice fit the music perfectly. A virtual sonic landscape appeared , out of, and beyond the speakers. I was transported to a larger yet intimate nightclub somewhere in the past and it sounded good, damn good. Bob was up there behind the old mic and the full band was behind him spread out across the virtual stage. It fit together. If you listen to the vocals you will hear a nice blend of chest resonance, mellow mid-range and some air, without excessive sibilance . As a musician and audio engineer, I know that every voice, style and genre of music can benefit when the right combination of microphone and processing is used to capture and shape that magical performance. We (audio engineers) put a great deal of time and love into recordings and mixes that we do for you and I for one, hold the process as sacred. It is a challenge to craft a mix that sounds great not only on good speakers, but also on less than ideal (crappy) speakers, like those used in laptops, tablets and wireless devices. They may be convenient but I think too many people forgot what music is supposed to sound like, in a great room with great speakers. Music and sound should be a total experience that affects your entire body. Earphones can not duplicate the effect of airborne sound on your body. My sister in-law recently called me a speaker snob. We were listening to some music videos on her laptop. I commented on how poor the music sounded and all the cool stuff we could not hear coming through the tiny tinny speakers in her computer. She is an artist, a painter. I asked her to imagine people viewing her beautiful watercolors as they hung on a wall in a dark dingy basement. Art is best enjoyed in a suitable environment with proper lighting. Music is the same. The room and the speakers are critical to hearing the music the way it was intended by the songwriter, the artist and the producers.